The Rothschild's or Baringo giraffe's distribution: western Kenya and eastern Uganda. Description: Giraffes are long-necked browsing animals that taxonomists place in a separate family, Giraffidae, from other artiodactylids: camels, deer and bovines. Possessing only seven cervical vertebrae (like other mammals), giraffes, at almost 19 feet, are the tallest of all mammals. Adult males weigh as much as 4,000 lbs. They are characterized by having two knobs, called ossicones, on their head. Some individuals may have additional bumps on the sides of their skulls that are irregularly located. Unlike antlers on deer or horns on bovids, ossicones are permanently covered by hair and never shed. After a gestation of 15 months, females give birth to a single young; twins occur rarely. Adults are not territorial but rather feed over a large "roaming" area. When alarmed, giraffes can reach speeds of 30 to 36 miles per hour. Unlike most mammals giraffes walk using both legs from the same side of the body simultaneously. When they gallop they move both fore legs and both hind legs together, and because of its long stride is faster than it appears. Female's horns are thin and tufted; male's are thick and bald on top, their horns can be up to 5 inches long. The color varies from brown to a rich chestnut (old males are darker, even black). Although usually quiet, giraffes are not voiceless as the common myth leads us to believe, but instead can produce snorting or moaning noises, particularly when there is danger. They have a good sense of smell, hearing and excellent vision enabling them to see miles away. Habitat : Giraffes roam over large areas of bush and savannah areas, living often in semi-desert regions where they get most of their water from their food. Like camels, they are able to go long periods of time without a drink and usually drink every 2-3 days. To get a drink they have to splay their forelegs to reach the water. The same is true of the okapi, disproving the idea that the giraffe's extra long neck and legs are the reason they must drink this way. 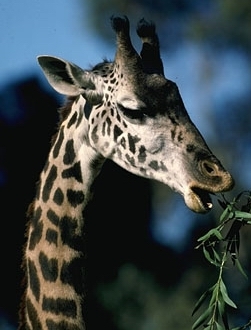 Diet : Giraffes are browsing ungulates, feeding almost exclusively on the new shoots of shrubs and trees. Acacia trees are by far their favourite food source, the leaves being stripped from their thorny branches with the assistance of the giraffe’s long prehensile tongue and lips. Social Organization: Giraffes are sociable, tolerant animals living in small groups to large herds or coalitions of familiar cows and calves which number from 12 to 15 animals. Although gregarious, group structure is constantly changing to some degree due to individuals’ overlapping home ranges. Including a surrounding "buffer zone", female home ranges may be as large as 46 sq. miles. Home ranges of adult bulls are smaller. There is no apparent dominance among females but adult males display absolute hierarchy within their home ranges. Giraffes have the same number of bones in their neck as humans do. Baby giraffes are about 6 feet tall when they are born. They are one of the few animals born with horns. The Okapi is a close relative of the giraffe making up the Giraffidae family. They only sleep for a few minutes at a time. Their heart weighs approximately 24 pounds. Giraffes are the tallest animals on earth. You would have to run in order to keep up with a giraffe walking because every step a giraffe takes is 15 feet long. A giraffe's neck can be 78 inches long. The giraffes' biggest enemy is the lion. Each time a giraffe picks up its neck it picks up 550 pounds! A giraffe is one of the few animals that uses mostly its front legs when it runs.